This is the towel Professionals keep in their garage! Works great for cleaning hands, engine bay, spills in the shop, etc. Use to clean instead of expensive microfiber towels! The DI Accessories Shop Towels will help you and your garage stay clean! Use these incredibly strong towels to thoroughly clean your hands, door jambs, engine bays, spills and so much more! When detailing we are constantly moving around the vehicle, pulling wires across the shop floor, moving carts full of products, etc. With all this movement, there is always a chance for an unfortunate tip or spill of your favorite product. If you do happen to spill some product, you do not want to have to reach for an expensive microfiber towel or paper towels that just shred and fall apart, instead grab just one Shop Towel! These towels are strong, absorbent and come in a convenient dispenser box. Keep them around the shop and simply pull one out of the top of the box for quick and easy cleanup. Each box comes with 200 sheets, meaning you have plenty of towels for various cleanups at any time. Are you careful and avoid most spills? 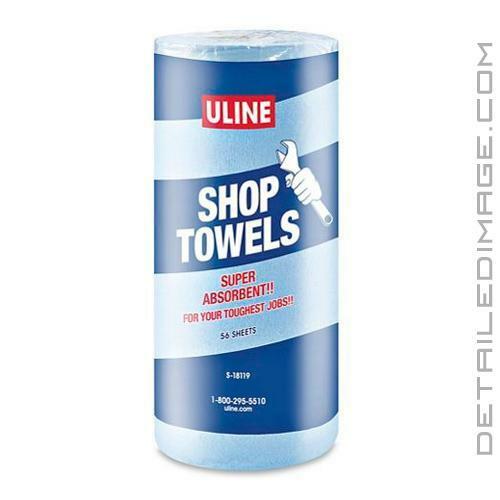 These towels also work great for cleaning your hands, door jambs engine bays and any other extremely dirty areas where you do not want to sacrifice a more expensive microfiber towel! While we don't recommend them on delicate surfaces they can be used all around your garage keep it looking clean and professional. Make sure you and your shop are always looking top notch with this incredible towel!